The 2016 Edinburgh Film Festival has now drawn to an annoying end after just under 2 weeks. Unfortunately for me, the majority of this was before my pay day meaning I missed out on a whole load of great film. However, I was able to catch one film that I had seeked out on the last day of the festival. 'Mr Right' was the lucky film that had the task of entertaining me but would it be able to deliver? Martha (Anna Kendrick) has just came out of a relationship and is down on her luck. Fate leads her to a new partner in the form of Sam Rockwell's character Francis. Francis however is hiding the fact that he is sort of a reverse hitman which leads Martha to make a choice to whether they split or if she stays with her Mr Right. I had heard of 'Mr Right' well before it being shown in the Edinburgh Film Festival due to it being from one of my favourite online personalities and screenwriter Max Landis. This really pushed me towards seeing the movie as I wanted to support him in particular. Also I enjoy anything with Anna Kendrick anyway as she is just great. With this combination, I was sure that I would get some enjoyment and to my luck, I was correct. 'Mr Right' most definitely is a very fun movie and is mainly due to the two lead performances within the film. Sam Rockwell is very good as this professional assassin who kills those who have hired him rather than the intended targets. His eccentric ways and killer instinct prove to be a cool mix that creates a very enjoyable viewing. Anna Kendrick plays quite an unhinged woman in Martha, who clearly isn't all right in the head. Again, Kendrick is highly entertaining and amusing as the film goes on. The comedy in the film does work really well in the film as well and is genuinely funny. The jokes are very clever and work well with the characters as the conversations flow with the jokes being ever present. The writing for the comedy elements work tremendously well and will bring you some laughs for sure. The characters of Francis and Martha are written very well which creates likeable and enjoyable characters to watch. Unfortunately, I feel that the praise for the film really ends at that. The film really is silly with the routes it takes and with some of the other characters. The film is pretty self aware of this but I don't feel that it should be excused due to this as it does seem like quite a cop out in the way it handles some of its scenarios. Sometimes characters are able to do incredible things and then are a shadow of themselves in the next scene. There are times when people seem to have changed sides in the fight against Francis which happens a number of times throughout a short period of time. A lot of the time, actions were happening only to further the film and didn't make sense to why it actually happened. I feel that the action in this movie is really quite inconsistent in quality as well. There are some scenes where some truly great action pieces take place and work fantastically well. The choreography works well throughout these scenes which makes it odd at points where it doesn't work nearly as well. At points the action seems way too slow as if you can see the actors really trying to be careful and it doesn't flow that well. The standards aren't kept up throughout the whole film which does also make the film suffer at times. 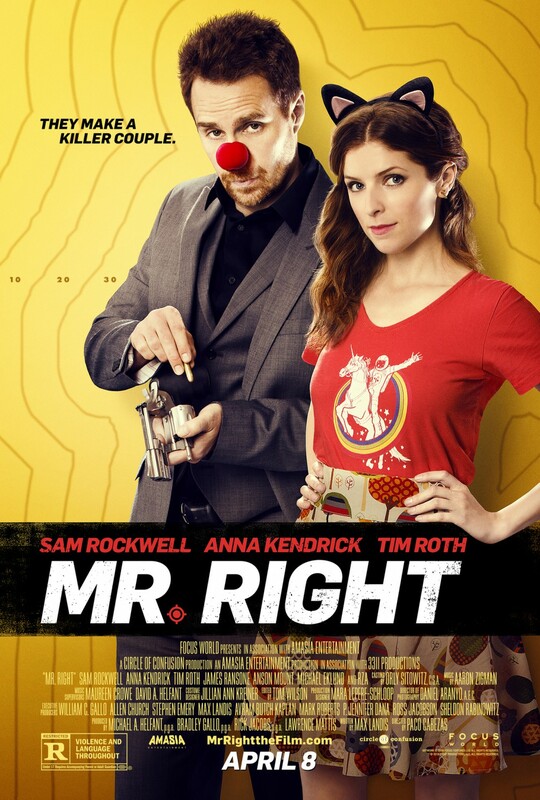 'Mr Right' is a fun movie that is enjoyable to watch for sure. There is no doubt that this is on of the films that you would stick on just for fun and if you don't want to think too much about. It's far from a masterpiece but most definitely has its moments with good comedy and performances from Rockwell and Kendrick. So have you seen 'Mr Right'? If so what did you think of the movie? I hope this review was useful for if you were planning on checking the movie out. It seems to have been released much earlier elsewhere in the world so may appear on the likes of Netflix where I would recommend you checking it out. Once again, thank you for reading my review, it is much appreciated!